As Moses was about to leave Egypt, God said, “Every man should take a lamb for his family. If it is a small family, then they can share the lamb with his neighbor. The lamb that they choose must not be suffering from any disease. The meat should not be eaten raw or boiled. The meat of the lamb must be roasted. They are to smear the top doorframes of the houses with the blood from the lamb. So that when I go amidst the Egyptian to kill their firstborn and see the blood on their doorpost, I will pass over and spare the lives of your firstborn. They are to eat the meat with bread that is made without yeast. Don’t store any leftovers of the meat. You must burn all leftovers. God continued, “On this day, all Israelites must celebrate the Lord’s Passover. The Israelites shall eat bread make without yeast for seven days. Then Moses told the Israelites what God want the Israelites to do. 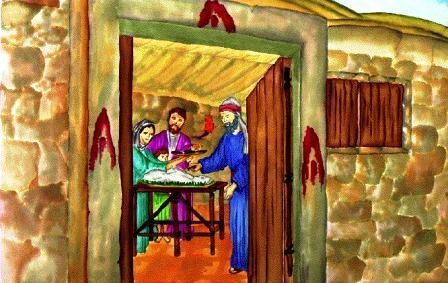 Every man in the family took a lamb and then killed it and smear the blood on their door posts so that the angel of death will Passover and spare the lives of their firstborn.